Like it’s cousin, Jackfruit, Breadfruit was a staple when I lived in Sri Lanka – and, boy-oh-boy, is it versatile! 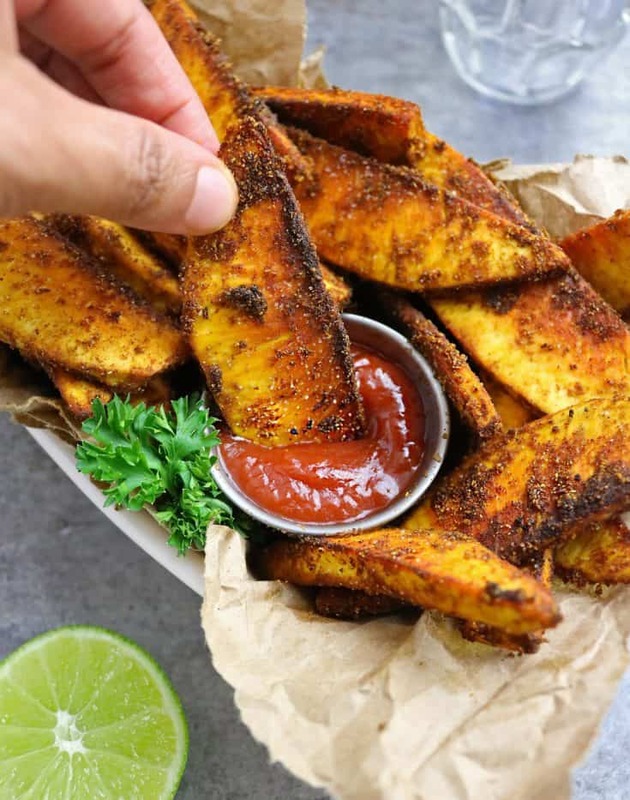 It can be boiled, baked, and roasted and enjoyed either in a sweet, savory or spicy dish – like these Spicy Breadfruit Fries. When I lived in Abu Dhabi, I used to frequent a Social Center with a bunch of other friends. There were badminton courts, table tennis tables, foosball setups, study-nooks and the like, geared towards us teens! Back then I took this teen-hangout totally for granted (if you are new to this space of mine, I spent my elementary school years in Sri Lanka and my middle and high school years in Abu Dhabi due to my parent’s jobs). When I came to the States to attend college, other than The Y, I couldn’t seem to find anything like that teen Social Center here in Atlanta. At one time, I had this brilliant idea to open one up myself – but then abandoned it when some friends started pointing out all the not-so-rainbows-and-unicorns scenarios that could happen. While there might not be a whole lotta teen social centers here in Atlanta, there sure are a good number of Senior Centers. And, am so thankful my mom ended up joining one shortly after my dad passed (this August will mark 3 years since he passed), as it has given her something to look forward to. Recently, she went with some of her buddies from the Senior Center to The Buford Highway Farmers Market and told me I had to take my daughter there as there were more fruits and veggies there from our early days in Sri Lanka. Of course, I had to take her up on her suggestion – and that’s where my daughter and I ran into Breadfruit. Ripe Breadfruit is considered to be a fruit, but some folks refer to it as a vegetable when it’s mature and not fully ripened. Some folks say it can taste like freshly baked bread, but, that’s not been my opinion. 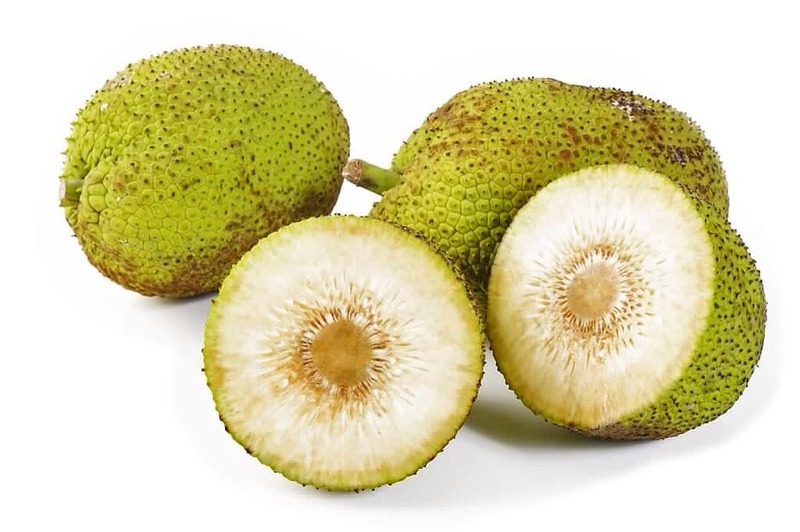 From the outside, Breadfruit looks similar to it’s cousin, Jackfruit. Also like jackfruit, it’s incredibly versatile and, some say, has a distinct odor. In Sri Lanka, it used to be a budget friendly, nutritious option to feed many, many different ways. Breadfruit can be boiled, roasted, baked, curried, and enjoyed as a sweet treat or a savory/spicy dish – ripe, sweet, breadfruit can also be enjoyed raw! When my mom gets her hands on breadfruit, she uses it to make a killer curry. But, I didn’t go the curry route when I got my hands on one. I, instead, peeled it, sliced it, and treated it like I would potato wedges. 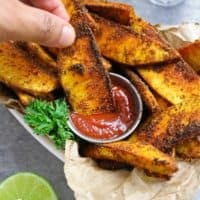 I spiced these up with coriander, smoked paprika, turmeric, and cumin and baked the heck out of them and simply enjoyed them with ketchup. Have you happened to run into breadfruit in your neck of the woods? 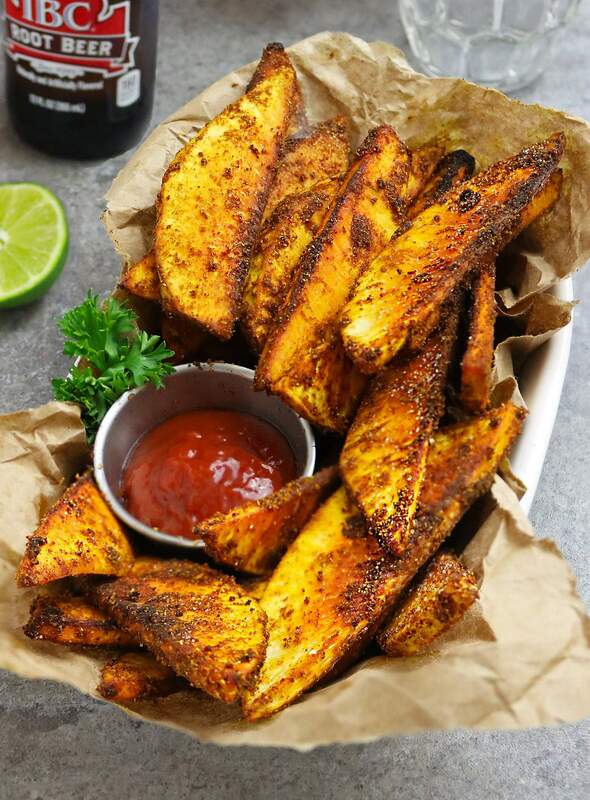 If you do -maybe you’d give these Spicy Breadfruit Fries a try? 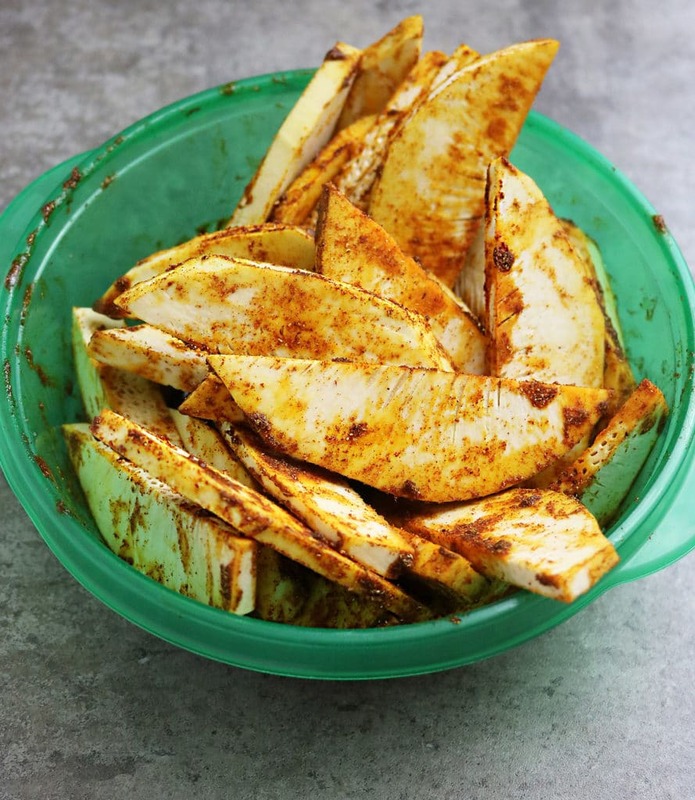 Spread out the breadfruit pieces on a foil-lined baking tray and bake for 18-20 minutes. Enjoy with ketchup or sambal oelek. My mouth is watering and I can’t wait to get my hands on some breadfruit! Those fries look delicious! Breadfruit is just starting to come to the US…I’d love to try it! 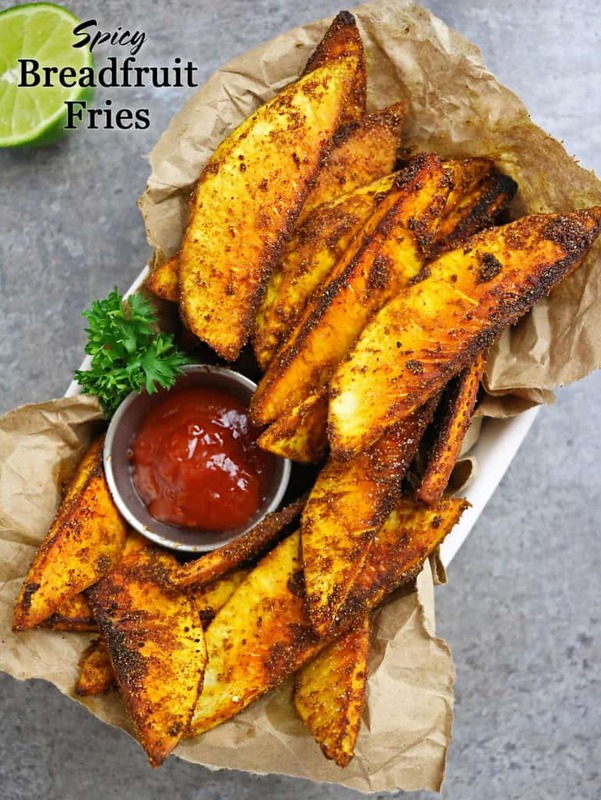 These ‘fries’ look incredible, but I have no idea what breadfruit is! I’m going to do some research and save this recipe to try. Gorgeous photos! OMG – love learning about new fruits. And I’ve never heard of breadfruit before! Looks interesting and can’t wait to give it a try! I HAVE seen these! I didn’t know what they were. The next time I come across them, I am going to make your savory breadfruit wedges. They look fantastic! wow These look incredibly delicious! Don’t see jackfruit over here…such a pity because I am dying to try these! Hmmm…breadfruit. That is most definitely not something I’ve come across in my wanderings here in upstate NY. Oh, how I miss Buford Highway and the DeKalb Farmer’s Market. You could always find interesting things in both of those areas! (Although I’m not sure I ever saw breadfruit at DeKalb?) Also, speaking of farmer’s markets, have you been down to the Atlanta Farmer’s Market? (It’s down in Forest Park near the airport.) It’s where restaurants go to stock up on stuff, and it’s worth a trip! We’d always find our SC peaches there…straight off the back of a farmer’s truck from SC. 🙂 Anyways, I’ll have to keep my eye out for breadfruit. This sounds super unique and interesting…not to mention delicious! Like Jackfruit, I don’t think I’ve ever had Breadfruit before either Shashi. Both of these are now on my list of “must tries” that hopefully I will meet on more of my exotic holiday adventures to come! Well dang! I haven’t heard of breadfruit before but your recipe makes it look mouth watering! I just heard of Jackfruit too. Sadly, I don’t know if my local grocer sells either breadfruit or Jackfruit but if I ever find it, I’m coming back to try this recipe!